When you’re finally looking at the end of 75 pounds of peaches, and you feel as though you’re losing the race against time; just freeze them! 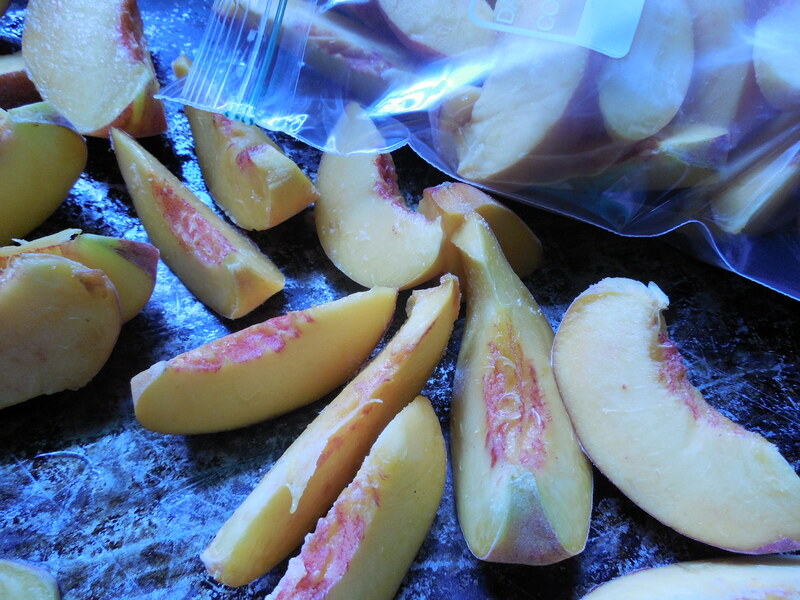 This is the easiest process for preserving huge quantities of very ripe peaches. I didn’t do anything special to the peaches, I just washed, pitted, sliced, froze on cookie sheets, then stuck them in freezer bags. They will be delicious later on in smoothies! I already canned some spiced peach pie filling, but if I run out of that, these will do nicely for a quick cobbler. Now I’m working on a laundry basket full of sand pears! Recipes and tips coming soon! I’m going to pretend I didn’t read this post about peaching after recently finishing the sweat-inducing task of blanching, peeling, and slicing 50 lbs of peaches 🙂 But we do a lot of freezing of other things – right now it’s okra as it’s crazily growing here! That is a lot of peaches! I hope you made yummy stuff! Did you make any jam? Homemade peach jam is sooo good!! haha, freezing sounds like something evn I can handle! Super easy and preserves that summer taste! Great idea, I think i shall try that with the glut of Victoria plums I have. If I run out of peach jam, I intend to pull some peaches out and whip up some jam; maybe you could do the same with yours. Eat a fresh one for me please!